In Apple Mail, there is functionality to add additional email addresses per email account. In G-Suite (and I would assume Office 365) you can set up email aliases and the additional email addresses in Apple mail associate with those aliases. My issue is the need for a different email signature to be set by default for each email address, not account. As you can see here I have multiple email addresses for this one account. And here you can see that this account has two email signatures, but I can only set one of them for both addresses. What options do I have to fix this? Browse other questions tagged mail.app email gmail . Mail.app: How to use multiple From: addresses for the same Gmail account? 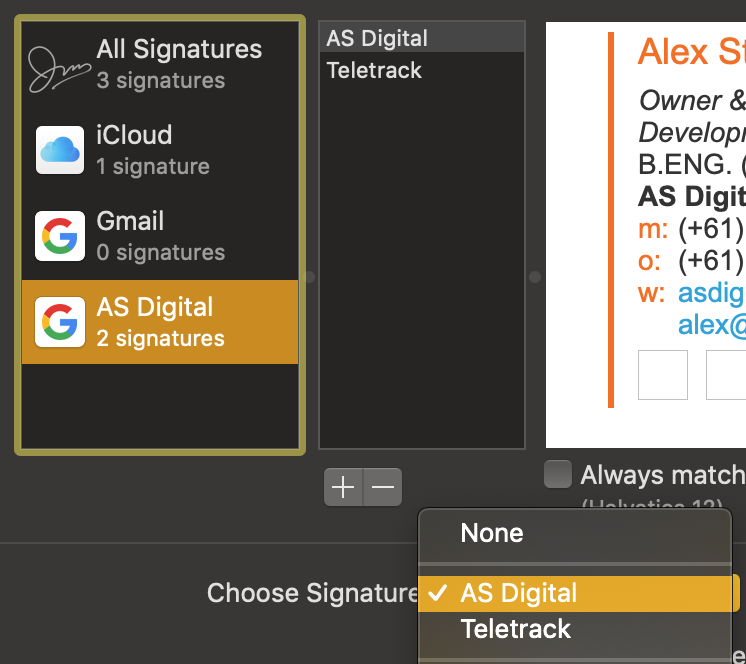 Mail.app: How can I set a different default signature for each address? How to have multiple names in Apple Mail?